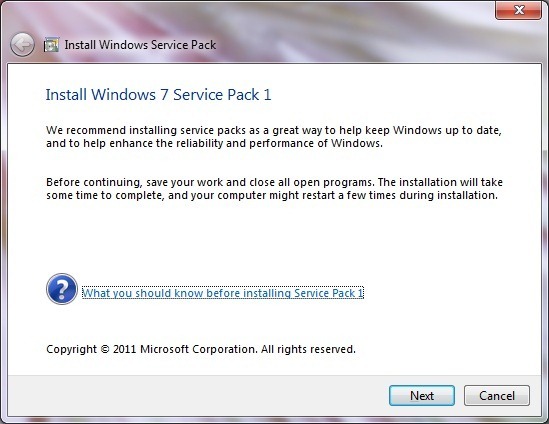 Back in early July, Microsoft released the first beta for its first major maintenance update for Windows 7 called Service Pack 1. To be honest, major is kind of a loaded word since there is not much to see on the client side of things. What you should expect is a collection of all updates that have been released for Windows 7 since the OS went to manufacturing July 22nd 2009. I decided to try out the RC to see what’s new, but there wasn’t really anything new at all, I did notice that the installation took longer than the beta, approximately 2 hours. The offline installer was used for the installation, since my Internet connection is unreliable and I have a few machines to update, if I need to reinstall Windows 7 RTM for some unknown reason, I don’t have to download every single update for the machine. I have managed to work around even such a situation by keeping recent in tip-top shape system images of my system to avoid doing such as thing. System Imaging is now included in all editions of Windows 7 and I find it very handy and convenient. Nothing of significance, the setup screen displays a 2011 Copyright instead of 2010 in the initial beta and as I noted early, it takes much longer to install, based on my experience on this particular system. 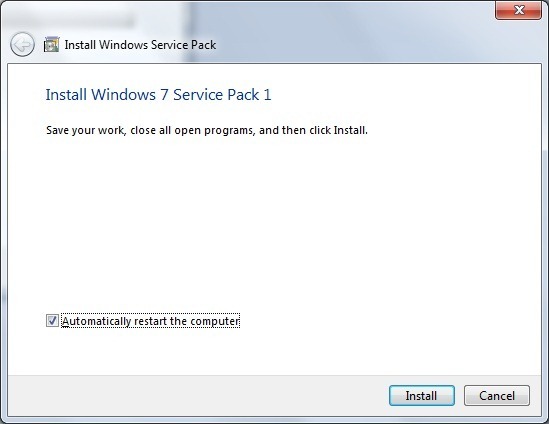 The update was applied to a production Windows 7 Ultimate 64 bit RTM system last updated in June of 2010. One welcome change that has been introduced is the SP no longer require that I remove Microsoft Security Essentials before proceeding with installation. After the installation is complete, your computer will go through a series of restarts and that’s it! My applications and devices are functioning just fine so expect a smooth experience, although its still pre-release software, so if you discover an issue, definitely send it in. If you are using Windows Server 2008 R2 though, which is Microsoft’s Network Operating system, you will see significant new features and functionality such as a Dynamic Memory Manager and Remote FX. Microsoft has not provided any information about when the final release will be available but rumor say it should be here in Q1 2011, but I would like to implore again, a lot of what you will see in SP1 is already available to you through Windows Update. 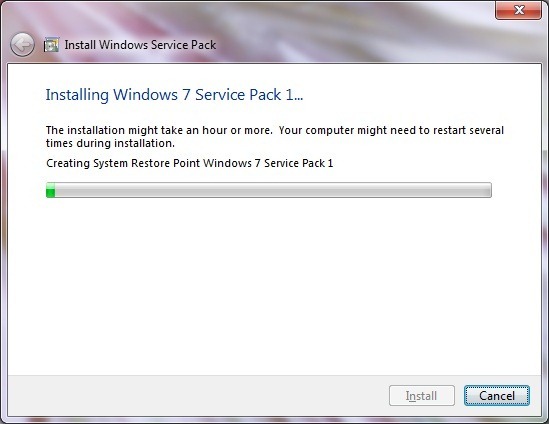 Windows 7 RTM today is a great release, so if you have not upgraded to it, its definitely the right time. 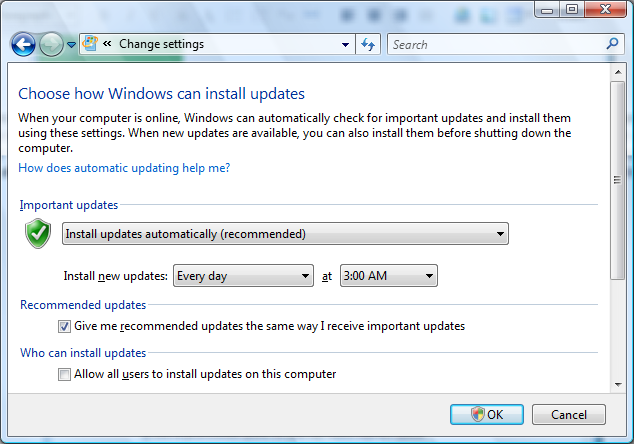 A couple weeks ago Microsoft released a healthy dose of updates for our Windows systems. Not everyone will welcome this with joy, since Windows Updates, although a very important part of your PC health, can interrupt your workflow when you least expect it. 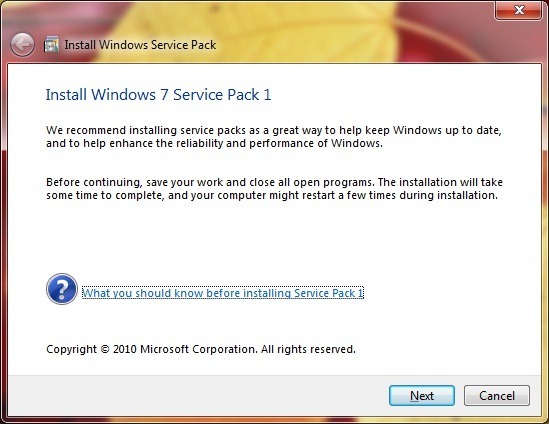 With the release of Windows Vista, Microsoft introduced major changes to its servicing and maintenance infrastructure. 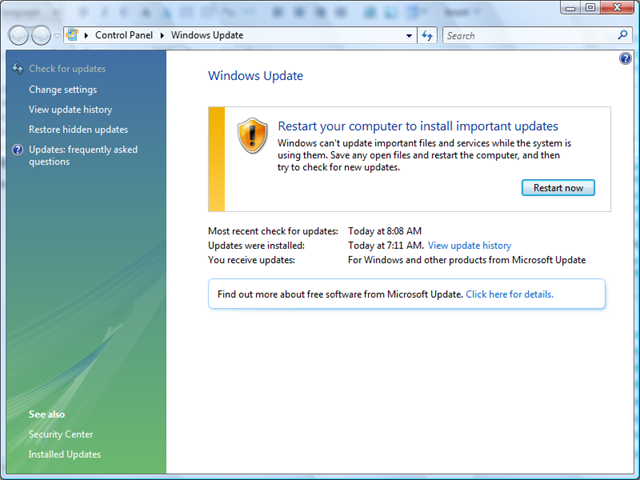 Windows XP and prior versions of Windows utilized the Windows Update Service page to manage and download the latest updates. Although updates can be downloaded automatically without any intervention since it is automatically set to do so, you might prefer to do so at a time more convenient for you. In Windows 7, there are some small improvements, mostly visual, the main Windows Update page displays a large banner with quick information such as the amount of available and optional updates, in addition to information such as the total size of the updates. Updates can be reviewed and downloaded immediately. One of the nice features of Windows Update is, it now allows you to set any user privilege to download updates without the need for Administrator rights. If you are still running Windows Vista, you can also benefit from the new Windows Update experience, the Microsoft Update Team enabled support for Windows 7’s predecessor as you can see in the above screenshot. Windows Update is more organized and easier to navigate compared to the previous iteration, in Windows XP, you could only view updates through the web browser. You can view updates offline, updates are better organized too, for instance, updates are categorized whether it be an update that protects your computer from a vulnerability, adds stability, while Optional Updates provide features that are not necessarily needed, but can add functionality. Microsoft has added a Details Pane on the right of the Windows Update Explorer. When you click on an update it provides a description of the update such as the associated application or component with links to additional information. As I noted earlier, installing updates can happen at the most inopportune time. For instance, you might leave your PC on overnight for whatever reason, whether you are downloading something or you are running a mission critical program. Windows Update by default does not realize this although Microsoft has refined the behaviour since the release of Vista with a Windows Update Notification dialog that gives you the option of delaying a restart needed to configure updates. This is of course is only when you are wide awake in front of your PC. Select the option, Download updates, but let me choose when to install them. Side note for users running Windows XP, you can also do this by clicking Start, right click Computer > click Properties > Automatic Updates (tab). 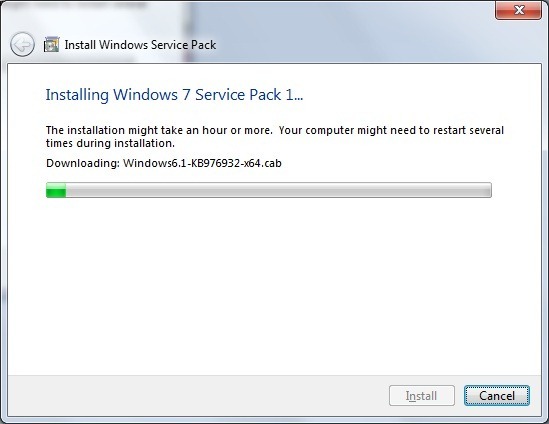 – Download and install the update manually – Although you can download Windows Updates through the Updates explorer they can also be obtained from http://www.microsoft.com/downloads All you need is the KB number and a simple search of the site, download the update and install manually. – Disable your Antivirus utility temporarily – Certain Antivirus utilities are very sensitive and are designed to detect the slightest changes that are being made to the system, whether its updating system files or making changes to the Windows Security configuration. The Antivirus might think it is doing the right thing by preventing that update from going any further. So, disabling it temporarily while the updates are installing is always recommended, but always remember to re-enable after doing so. – Make sure your date and time are correct – This is another gotcha for users, your date and time might be incorrect, which could be why you are not seeing the latest updates or why they are refusing to install correctly. Make sure your date and time are correct. You should also check the BIOS to make sure it is generating correct date and time. If it is not doing that every time you start your computer, it means the CMOS battery is dying or defective and needs to be replaced. You can do yourself, its quick and easy and the chip cost about US $1. If you are not comfortable doing it yourself, take your computer to a PC Servicing shop and let them do it for you. Tip: Save the download to your desktop then run the installer. Follow all prompts. 2. Reboot, if not prompted to do so. How can I tell if my computer is up to date? Scroll down and look for the update that is causing problems, select it, right click it and then click Uninstall and Restart your system. If you know that this update is problematic and your system functions just fine without it, you can hide the update, open the Windows Updates Explorer. Select the update that is listed, right click it and click the Hide menu. From now on, the update will not appear any more or install with other updates. If you believe that this is an update you might need to install, but you discover that it is problematic, well, it depends, if its a driver for instance, that means its provided by a third party, such as a video driver update or an update for your wireless adapter. My suggestion is to check the manufacturers website and download the latest driver from there or consult the developers support options to find out what is the best measure you should take in regards to updating that particular driver. Open Control Panel, in the View By menu (top/right) select one of the icon views. Click Troubleshooting. On the bottom of the screen, under System and Security, select the Fix problems with Windows Update troubleshooter. Follow the instructions. You can also check the information in the following article. Also, try reviewing the Windows Updates and install them in batches. For example, if you see 35 updates are available for download, don’t download and install all 35 updates one time. Look at the smallest updates that range in KB’s and install those first then restart your system. Do another 5, avoid hardware updates first along with .NET Framework updates, I notice these can affect how long updates take to install and configure on shutdown. If Windows Update problems continue to persist, then its time to get your hands dirty. a. Click Start, click Run, type %systemroot%, and then click OK. Create a new folder called "SoftwareDistribution"
Restart your system and try updating your system again. 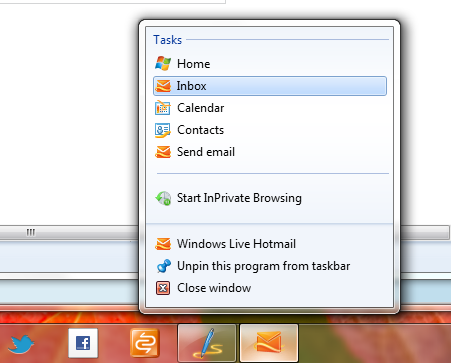 You can now Pin Hotmail on your Windows 7 Taskbar! Last month Microsoft launched the innovative next generation version of its popular browser, Internet Explorer 9. 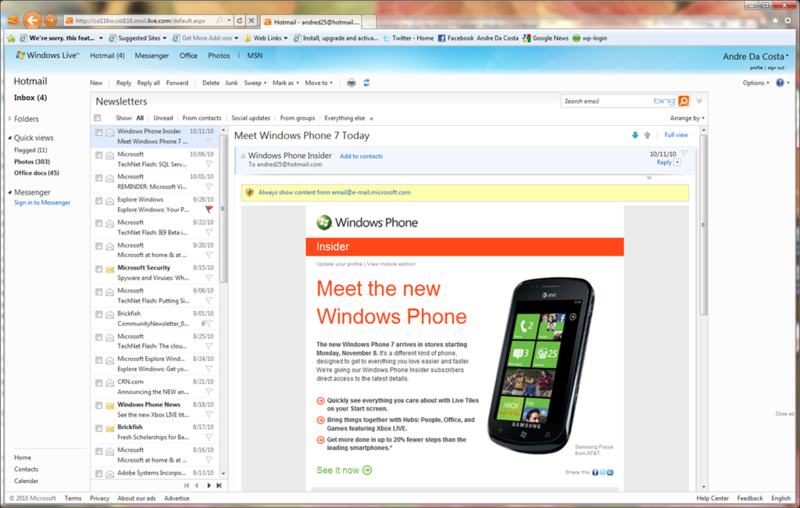 One of the major highlights is the app centric experience IE 9 introduces. This makes it easy to access your favorite websites in Windows much easier while also providing unique co-branded experiences. The Windows Live Team are updating their various web properties and services to take advantage of all of Internet Explorer 9’s cool features. Windows Live Hotmail wave 4 now lets you not only pin to the Taskbar, but quickly access aspects of the service through a Windows 7 Jumplist. Tasks you can access include your Windows Live Home Page, Inbox, Calendar, Contacts and Send Mail. Just as a reminder, if you don’t know how to create a pin icon, simply hold down your left mouse button the icon for the URL in the Address Bar. Then drag it to the Windows 7 Taskbar. I read/watched an interesting blog entry by Ben Rudolf of the Windows Team Blog about an option customers have at the Microsoft Store to have their PC’s customized and optimized with Windows 7 and just the essentials installed called the Microsoft Signature. One of the things I have noticed over the past 3 years is the cut down of trialware that is included with most new PC purchases. A Dell Inspiron a friend received for back to school, included a small bundle of programs most users out of the box can immediately take advantage of. To get your PC configured this way, it must be purchased from the Microsoft Store, if you purchase your computer from another retailer, you will need to take it into your nearest Microsoft Store and have them configure it for you. One of things users don’t like about OEM Windows installations is the trialware is often integrated with the recovery media, so even if you attempt to do a clean install, you are basically going to reinstall the same programs you are trying to remove. …you can get Microsoft Signature on any PC purchased from the Microsoft Store. But what if you buy a PC somewhere else, but want the Signature Experience? That’s where the other half of Signature – Microsoft Signature Upgrade – comes in to play. 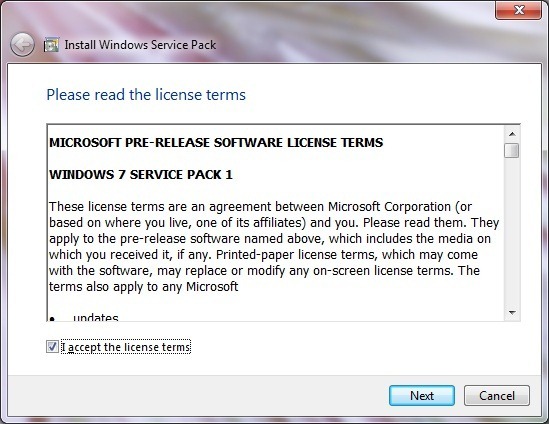 If you live near a store, you can bring in any Windows 7 compatible PC and the Store techs will do a clean install of Windows 7 (you’ll need to buy a full retail copy, of course), migrate all of your data, and then apply the Signature configuration to it (i.e., set it up almost exactly like a Microsoft Store-bought PC). It’s a great way to make your PC experience even better. If you don’t have the option of visiting a Microsoft store or don’t live near one, here is a more cost effective method, create your own Signature Windows 7 PC! 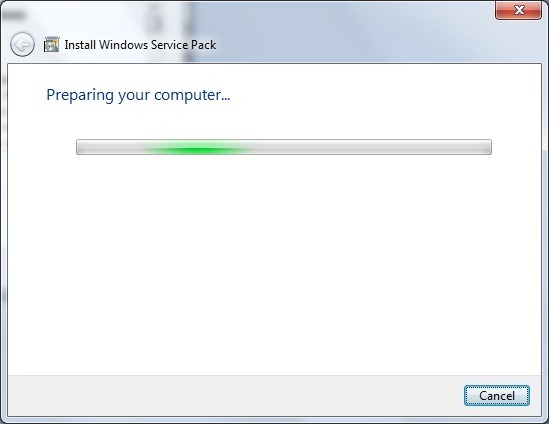 Select the programs you don’t want to have installed, then click ‘Change/Uninstall’ button on the Command Bar and follow the on screen wizard to uninstall it. Repeat this process for other programs. Once you have uninstalled the applications you don’t need, restart your system. Run disk clean up on the drive on which Windows 7 is installed. 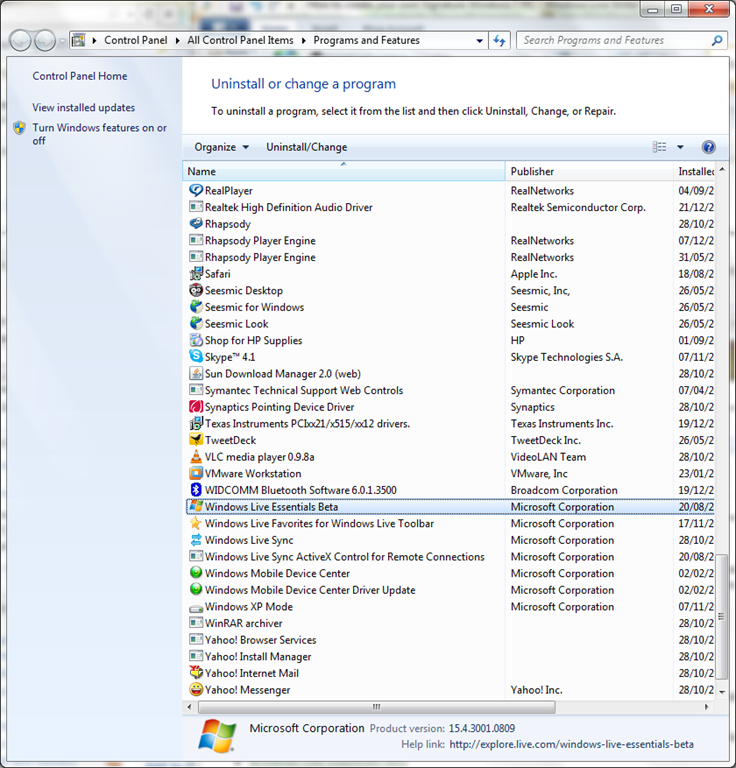 Recommendation, download all these programs first before you start any installation. Microsoft Security Essentials > Adobe Flash Player > Microsoft Silverlight > Zune Software > Windows Live Essentials > Adobe Reader. (Please note, if your computer came with an Antivirus utility installed such as a trial version or you installed one yourself, uninstall it before installing Microsoft Security Essentials to avoid any conflicts. Restart the machine if prompted. Go ahead and do the backup to the external hard disk. Follow the same procedure, change the name again to something else as to avoid overwriting that signature backup we just created. There you go, no need to request OEM media and at the same time you are learning how to take charge of your own Windows 7 PC. For some novices or intermediate users, going to the Microsoft store might still be best if you are not comfortable with these suggestions I provided. The beauty of the Windows ecosystem is, you might just know a trusted family or friend that can guide you through this process.